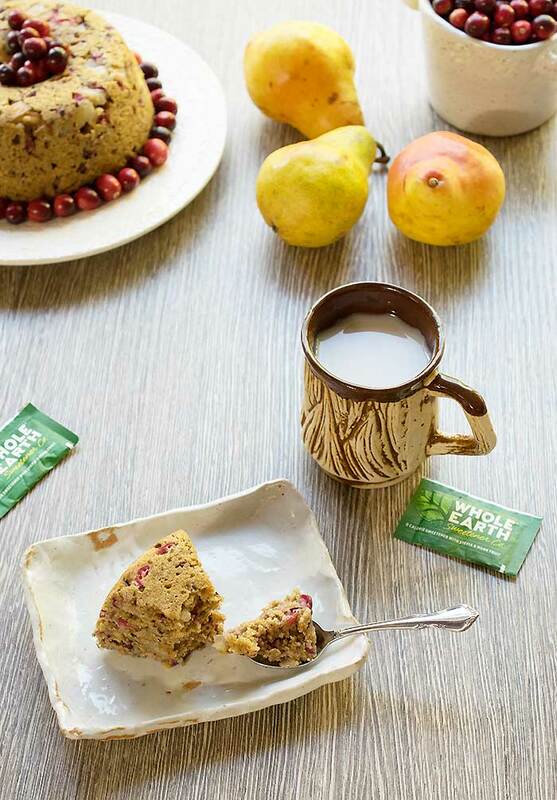 I’ve started to get ready for the holidays and receiving a shipment of sweeteners from Whole Earth Sweetener Co. put me in the mood for making some healthier sweets. I also got a ton of beautiful, fresh cranberries and knew I had to make something delicious with them. 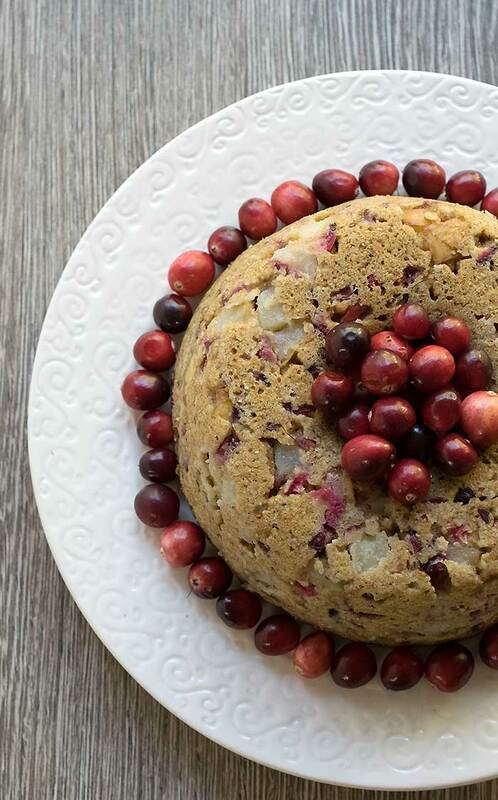 That’s how this Vegan Pear and Cranberry Instant Pot Cake came to be. When you make a cake in your Instant Pot using its pressure cooker setting, it comes out super moist and a little heavy – almost like an English steamed pudding. I used the Whole Earth Sweetener Agave 50, which is a mixture of agave and stevia. I love it because I usually combine the two together in baking so this was perfect for me! 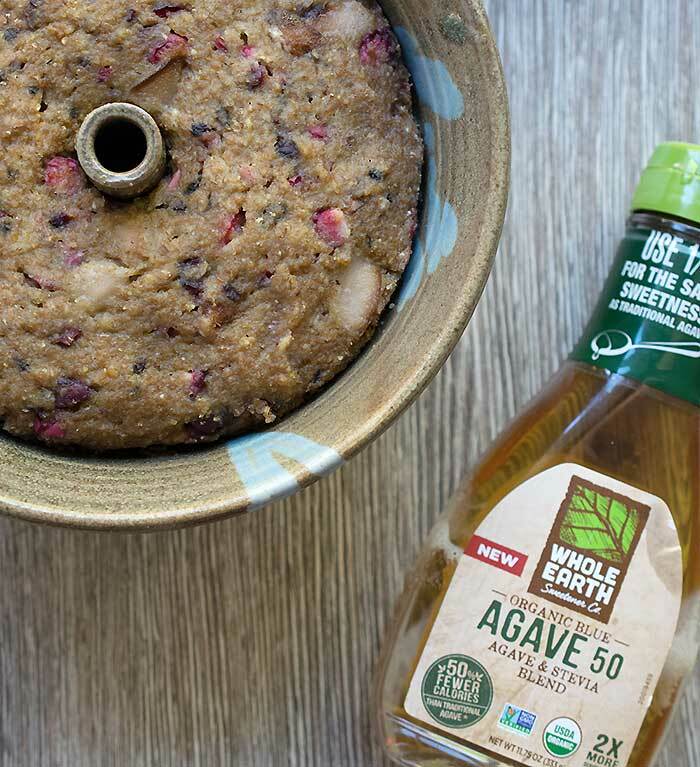 Whole Earth Sweetener Agave 50 has 50% fewer calories than agave per serving. I love the fact that it’s organic and Non-GMO Project Verified. In addition to baking with it, Agave 50 is great in cocktails and as a pancake topping. You can buy their products on Amazon, but you can look here to find products in stores near you. 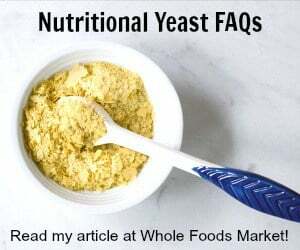 It’s in select Whole Foods, Kroger and many other grocery stores. Don’t Use Agave or Stevia? Now back to the cake and the recipe you’ll definitely want to make for your family! It’s full of whole grains, fresh pear and cranberry too. Depending on your pear’s ripeness you may want to use a little more or less sweetener. If they are very ripe use less and if they aren’t very ripe you may need to use more. Just taste the batter before you put it in the pan. Speaking of pans, this one uses a 6 to 7-inch mini bundt pan (or springform pan) that fits in your Instant Pot. Also, do not forget to add the 1 1/2 cups of water in the bottom of the Instant Pot and put in your rack to cook this cake. You always have to have water in it if you aren’t cooking something liquid. This cake is super moist since it’s steamed and reminds me a little of an English steamed pudding. You can vary the fruits to match up with the season. Oil a 6 or 7-inch bundt pan and set aside. Mix all the dry ingredients in a medium mixing bowl. Then mix all the wet ingredients in a large measuring cup. Add the wet ingredients to the dry and mix well. Fold in the mix-ins. Put the steel insert into your Instant Pot, add the water into the bottom along with the stainless steel steam rack with handles that came with your Instant Pot. Place the lid on with the vent closed and cook on high pressure for 35 minutes. Let the pressure release naturally. Once the pressure indicator goes down, remove the lid, carefully lift out the pan and remove the foil that’s covering the pan. Let cool before removing the cake from the pan and/or cutting. An alternative to cooking this dish in an instant pot would be wonderful as there are many who don’t have one that would like to try this recipe. I’ve tried for weeks to get a hold of you, all to no avail. Options are good. Since I’ve only made it in the Instant Pot I can’t give you exact times on baking it. I think it would work fine in a 350 degree oven. Cook until a fork or knife stuck in the cake comes clean. I’m not sure how you’ve tried to contact me, I have no emails or other comments from you. If you tried Facebook, sometimes they put things in a weird place that’s hard to find. You can always use the contact form on this blog and I’ll get back to you as soon as I can. I think you could steam this on the stove for the same amount of time. Probably longer, as the IP cooks at hotter temp due to pressure. This could easily be adapted, just follow directions for steaming an “English pudding” and see how it comes out! I’m going to give it a try in my electric pressure cooker! This looks amazing! I can see it on Thanksgiving, Christmas or any day of the year! If you bake it, how long? Since I haven’t baked it, I can’t give you an exact time. I’m confused–is a crock pot the same as an instant pot? Can this be made in a crock pot? I do not have an instant pot. It is different, though an Instant Pot has a slow cooker setting. The ip also has a pressure cooker setting and more. Well this sounds so good I think I may attempt this in the oven .. I cannot afford nor do I have room in my teeny tiny kitchen to store the Instant Pot … I found it easily on Amazon, though, for those having trouble finding 🙂 Happy Baking all !! I’m from the state of Washington & when I saw the name of your cake I thought it was a whole different thing. Then I read the ingredients & didn’t see cannabis, so I guess it’s another kind of pot cake! Joke’s on me! What else can you use in place of the agave? I made this using an 8″ square dish and the oven 350 degrees for 45 minutes. I used honey instead of agave. It seem too watery but turned out great. I’ll make it again. Do you need to make this in a special pot- the one with the stem in the middle? Not sure if I can find one that fits in the instant pot- can I just use a regular round glass pot? You should be able to make it in a round pan, but it may need a little more cooking time. Try it as written first. Made this tonight with glutenfree flour and the round cake insert for the instant pot Did not alter recipe or times at all. Perfect!! Everyone loved it-will be making this again!! Maybe adding walnuts. Thank you! 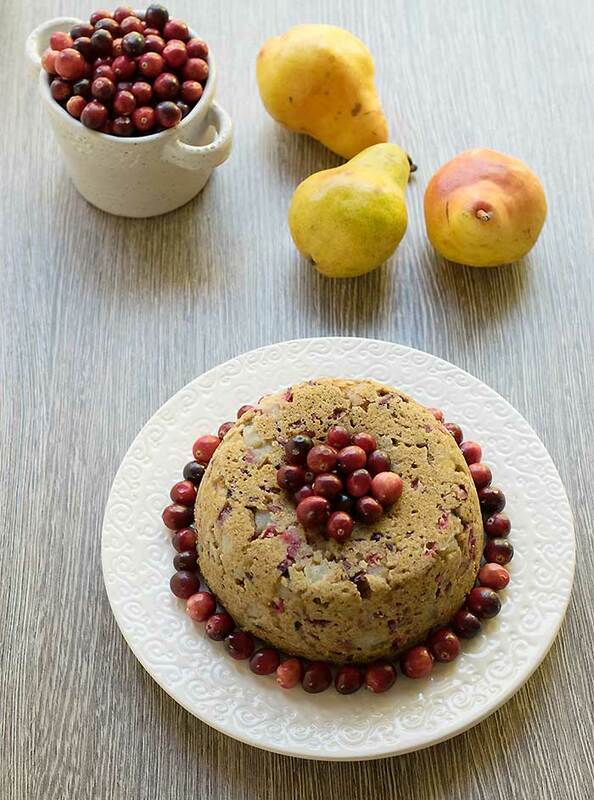 Thanks for finaslly writing about >Vegan Pear and Cranberry Instant Pot Cake – <Liked it! Hi! Is this recipe possible with all purpose flour or with whole wheat flour? Just curious! It should work fine You might need a tad less liquid, but I think it would work as is. Sorry one more question! 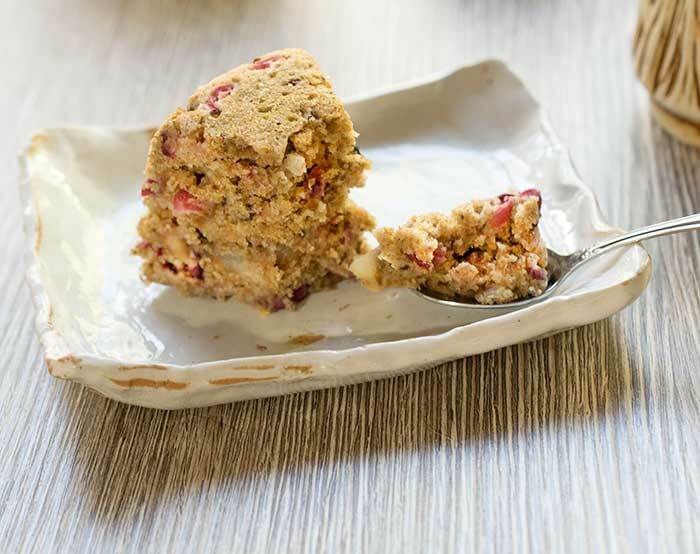 Can you use this recipe with only apples instead of pears and cranberry? Can a silicone bundt pan be used for this recipe? I still haven’t been brave enough to use my Instant Pot for any kind of baking. This recipe is really tempting me to give it a try! It looks amazing. well that’s it – I am on my way to find pears as soon as I can. making this! Hi. Can maple syrup be substituted for the agave? If anyone has made it with almond or coconut flour, would love to know your ratios and outcome..